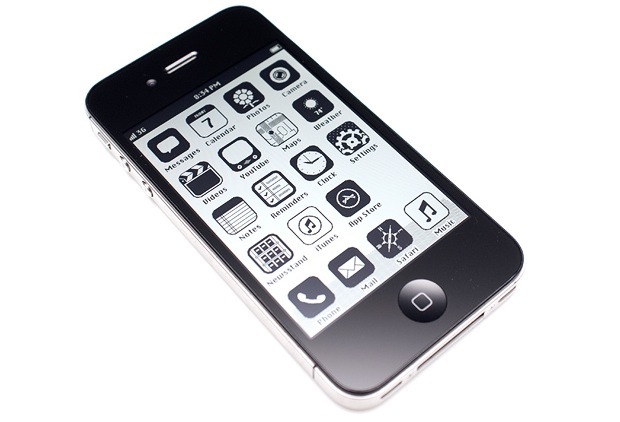 Update 2/22/2012: Want your iPhone to look like this? 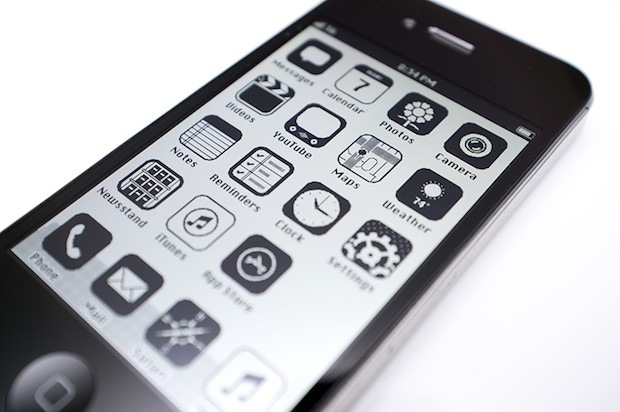 Here’s how to install the iOS 86 theme on an iPhone and iPod touch! 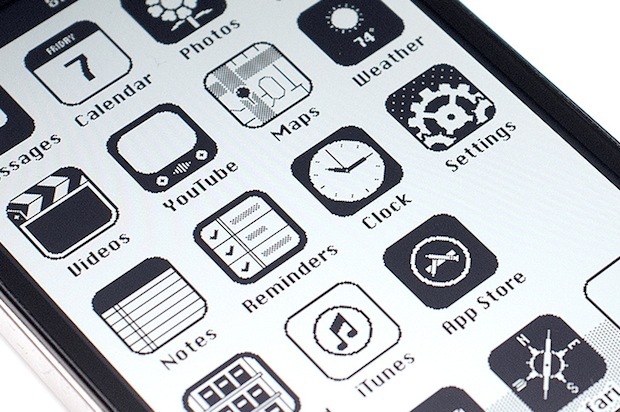 What would iPhone’s iOS look like had it been made in 1986? Maybe this, and it looks awesome in that retro sort of way. This is just concept art from a few designers who posted their ideas to LiveJournal, but I know I’m not the only one secretly hoping that someone will make a jailbreak skin or theme that matches the concept art, and if it happens we’ll certainly let you know. 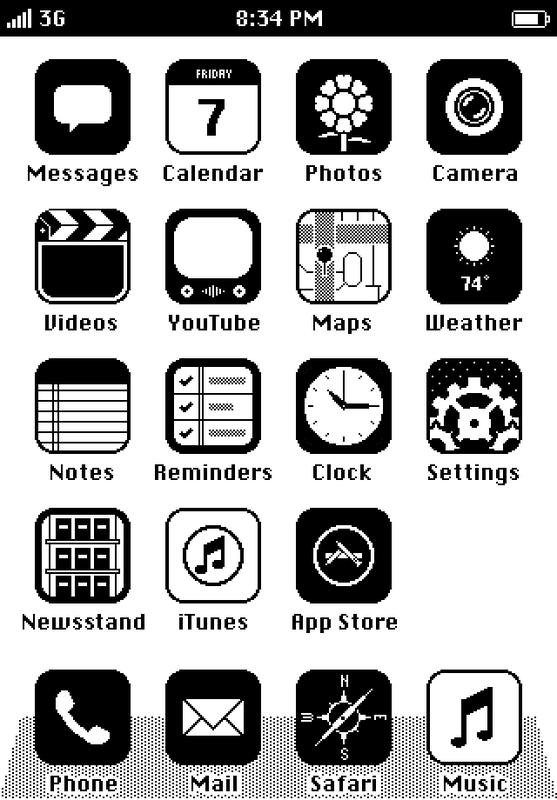 This iPhone theme combined with one of those 80’s block cell phone cases and you’d be the envy of everyone 25 years ago. This is a fun find by Gizmodo, but if you can’t wait until this skin gets (possibly) designed, you can try to run Classic Mac OS on the iPhone too. OMG I want this. How hard could it be to make this into a theme really? Jeez, I had Macs like that back in the day. For years, we would clamor for color. They eventually gave us grayscale, and we thought that was amazing. Then they finally gave us 256 colors, and we thought that was amazing. Now Apple wants to go back to grayscale or black and white, and everyone thinks that’s amazing. Sigh. I’m with you my friend… Let’s not repeat the past! Well Apple doesn’t want to. I agree with you though; retro in this form does get old. 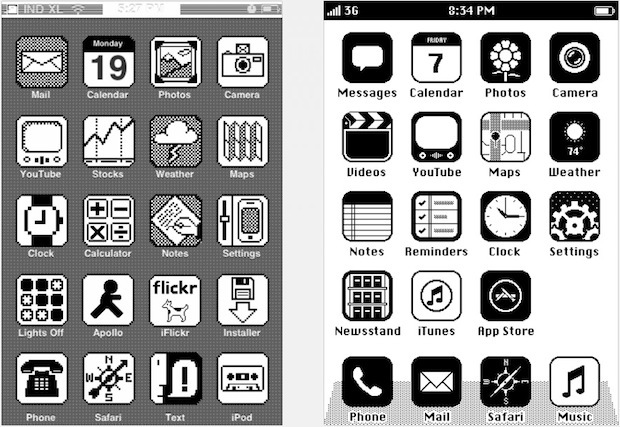 “Now Apple wants to go back to grayscale or black and white, and everyone thinks that’s amazing.” It’s not Apple, just designers and some consumers. Just look at a popular game now… Mindcraft! I can see the appeal but sometimes I just want some advance graphics. The hardware looks too modern. Not only that, but I want the level of graphics in the actual apps to match the look of the icons. Go everything retro, 100 percent. Pointless and absurd like most posts on this page! But the remark is more pointless and absurd than the page itself. It would have been more fun if they used actual apps used in those days like write paint, etc. Now THAT would be a good theme. What I wonder is why they seem so adamantly against choice. I can sort of understand their rationale that they want to defocus the UI to allow better focus on content. But that’s not an issue for me, nor does it seem to be an issue for many Mac users I see commenting about these matters. Why not, for instance, allow the option of using aqua scroll bars? Forgot about Hypercard! That brings back some memories. touchscreen in 1986. c’mon man this was pointless. at least make the hardware look like something out of the 80’s. all you did was make the screen monochrome. wack!!! As far as touchscreens in the 80s, go to Wikipedia and look it up or if you don’t trust them, go get yourself a book. I’ll save you the trouble of looking it up. Don’t make blind statements without proof. Granted Wikipedia isn’t always accurate, but the information can’t be far off. and the Apple Newton message pad, was 1st available in 1993. That means that Apple had to be working on this for at least 5–10 years before release, waiting for the cost of technology to come down in price, size And power consumption. If Amiga did it, on the other hand, it would look pretty similar to how it does now. This is not how it would have looked, think sinclair spectrum, teletext or ceefax the alphabet was almost unrecognisable never mind graphics. As for touch, try hitting the return key several times then unplug wait and try again. Wait for the analogue sound then you can start, but I don’t see a slot for 2 pence pieces so that you can make a phone call. Nice try but not authentic enough try Tetris for your symbols then you will be nearer too the mark. I wonder if the person who came up with this was born in the 80’s ? or after. In first left image, the phone carrier id is IND XL. Is it means XL Axiata? that is not at al what it would of lookeed like! to modern… make it like some type of wood or plastic! Needs Donky Kong….. seriously its that retro I am flashing back to dual screen handheld Donky Kong. And I was whining about Iphone, my bad. But it still wouldn’t have had C&P until 3 years after every other phone had it. “If Apple Made iOS In 1986…” well they didn’t, can we move on now? Change 3G to AMPS, TACS or NMT, and make the phone 2 inches thick and weigh 8#, and then we’re really getting somewhere. Would certainly improve battery life.